Sadly, not all New York tour buses are like me. I feel sorry for the folks shivering and exposed to all the elements atop those double decker buses. I know the riders chose the seats on the upper level because they wanted the best view of the Big Apple attractions. I wish they had known about my panoramic floor-to-ceiling windows, which provide amazing views in luxurious comfort. As you can see, you don’t have to sacrifice warmth and comfort to see the city when you’re on THE RIDE! 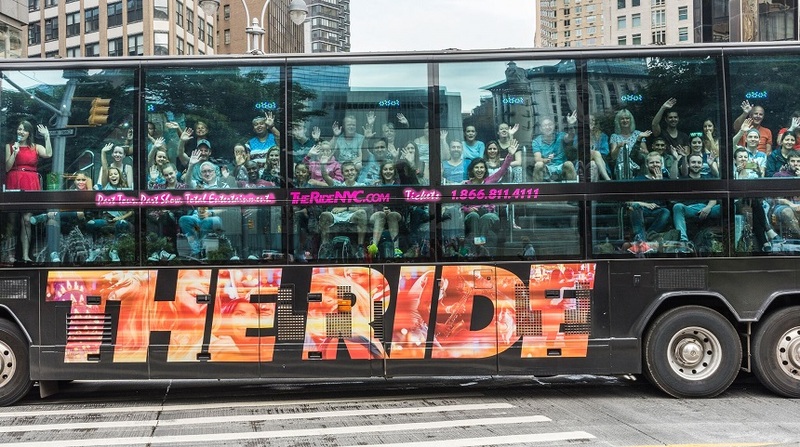 Incidentally, the spectacular views from these windows are just one reason that THE RIDE was named “Best Bus Tour” of 2019 by TripSavvy.com. And the windows are not just available on the classic RIDE, the interactive entertainment experience that has numerous awards and accolades. My warm and toasty luxury motor coach is also used on THE TOUR and THE DOWNTOWN EXPERIENCE, so you can enjoy comfort and panoramic vistas on those excursions, too. Here’s one more thing to warm your heart: right now, THE RIDE, THE TOUR and THE DOWNTOWN EXPERIENCE are all on sale! Use code WINTER30 and you’ll receive the special offer price of 30% off each ticket for all departures through 2/28/19. So truly it’s time to warm up on THE RIDE this winter!